It is finally starting to cool off in Texas. Where high 50s might be warm for many parts of the country, it is positively freezin' in the Lone Star State. I am one of those people who can never be warm in winter, even with the heater going! With fingers rapidly freezing into icicles as I type, some hand-warmers might be nice, I think to myself. Naturally they have to be fingerless, so as to not hinder my work, but long enough to cover about a third of my fingers, cover my palm and enough of my wrist to tuck into a sleeve. Hunting around for free patterns I found this one here by Suzetta Williams. Didn't look like much, which made me think it would get the job done perfectly. This pattern whipped up in about 2 hours total! FAST! I only changed the pattern slightly since after the pattern's 16 rows I didn't think they would fit all the way around my hands. I have a feeling it is because I was using a smaller hook than recommended, so I increased the rows to 20. To finish, rather than simply sew the first and last row I slip stitched them together and then turned them inside out to keep the seam hidden inside. I know that frillier/girlier people then me could easily add a trim or buttons or embellishments, but I liked them as they were. But then I remembered it was almost Halloween and regular hand-warmers are for the boring people of the world. SO, with two flat heart shapes and six little circles I created Kitty Mittens! Since the seam is already inside the long tails from the shaped used to sew them on will never be seen, either. 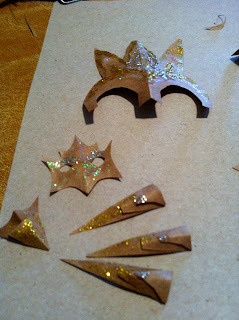 Simple, easy and fun. Meau! Just FYI: I used Red Heart in Grey Heather and I Love This Yarn in Rosy Cheeks. 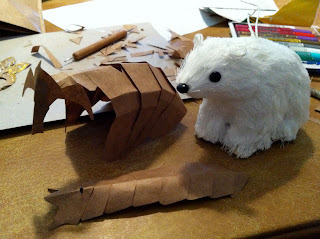 Now to find a ribbed hat pattern to match and make some ears.... OH and then I could make a scarf that looks like a tail! ...and then be looked at strangely forever more. A white elephant party is a tradition among my friends every year around Christmas. If you are unfamiliar with this kind of party I direct you to the Wikipedia article, which has the general gist of it. Through the course of the year, we develop many inside jokes as we socialize... not the least of which pertain to the movies we have seen as a group. Last year The Golden Compass and Legend of the Guardians: The Owls of Ga'hoole were popular material for being so very bad, far from the books they follow, and in the latters case, simply having a terrible, terribly long name. Naturally I had to get one of these movies for the white elephant party gift. A movie by itself is fine, but we all expect a little more from one another, something to make it scandalous, hilarious or pointless. In the past, a dvd jacket has been slid from the original (often bad) movie to cover an even worse movie. I decided to use a bit of skill to make a silly addition to the movie, something to remind everyone even when the offending dvd is tucked away. I found these ornaments at a local World Market. 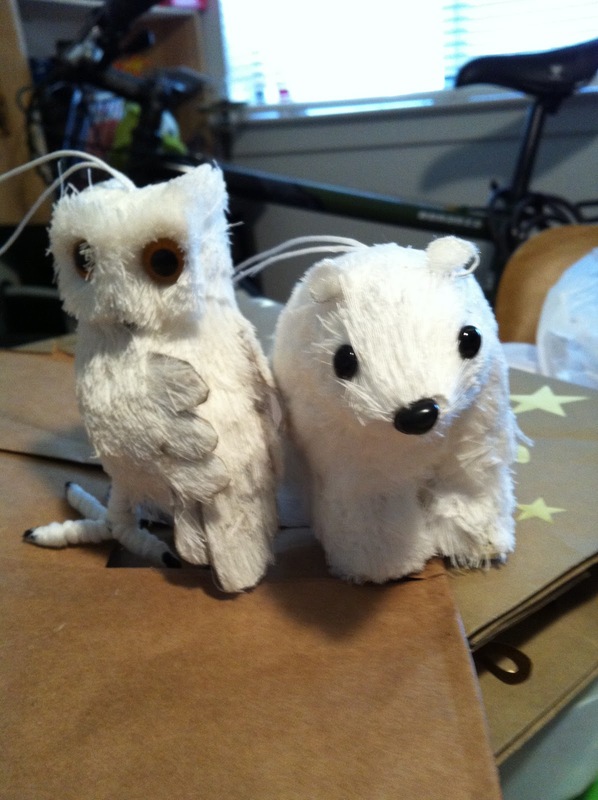 They were perfect; an owl for my present and a polar bear for me. One common thread in both movies is that the animals felt that wearing armor was the height of fashion. 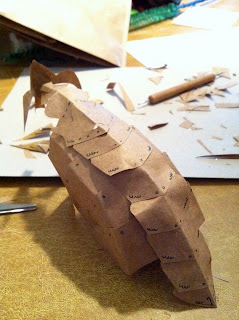 So, using an old paper grocery bag I began to fashion paper armor for these two. For the Owl, I followed the movie's depiction of a helmet kind of thing to cover eyes and beak and the deadly claw armor for the foot. And for the Bear, following it's movie as well I created a face mask connecting to tank-like plates of armor along the back and spine. After a bit of puffy sparkly paint was added for decorations, I attached the armor to the animals with a bit of invisible thread. For the bear it was important to add a hole for the hanging string to poke through so it could be hung on an actual tree. Shiny and majestic in their armor, they went off to new homes. Halloween is here and costumes are a must in my opinion. Why should our puppy be left out? 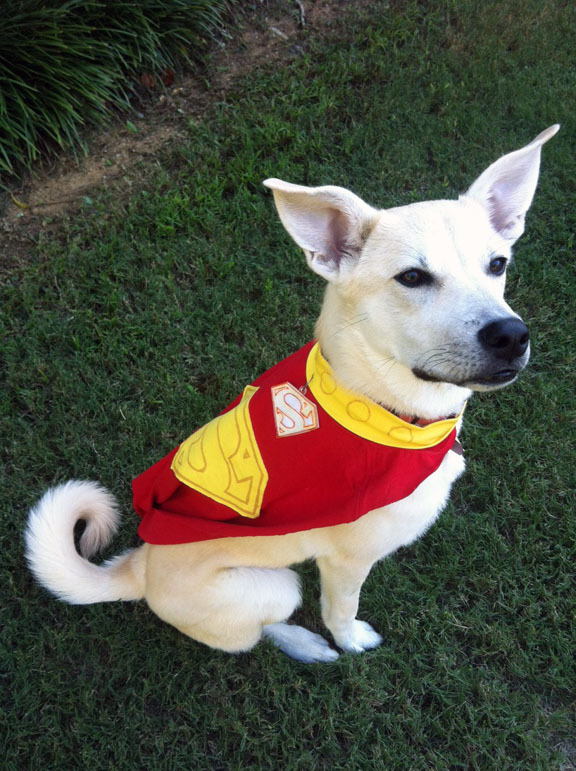 She is going as Krypto the Superdog! Her cape and collar were made from a couple of child's size t-shirts from your craft store. The studs on the collar and S logo were drawn on with a gold fabric paint pen. Finally her custom Superdog-tag is hand-drawn by me on shrinky plastic. The cape is safety pinned to the collar which fits like a tube over her real collar. With the perfect costume and pose, our little Gingko is ready to save the day! So, with my current position at Concrete Results, I do a lot of things. My position involves creating banners, flyers, e-blasts, e-newsletters, maintaining our Facebook pages, creating new websites, working on packaging for products, getting printing quotes, creating brands, etc. It is a challenging position that requires me to constantly be learning new ways of doing things. One of the most fun parts of my job, to me, is getting to design a new logo for something. I have a fascination with logos. A truly great logo says everything about a company without saying anything at all. The foundation of a good logo in current trends seems to be the type you choose. I feel like the personality then can come from the colors you choose. These two things can set the tone of either fun and whimsy, strict or tight-laced, efficient, archaic, etc. Here are just a smattering of some of the logos I have worked on... You might just see a few in stores in the near future. So I realized today that some of the older posts on this site have terrible grammar, some are just plain confusing, and most lack any artistic explanation of their subject matter. I guess it is to be expected; to feel that your younger self was a just a little bit dense. With that in mind I made a few changes to previous posts, not the smallest of which was fixing typos. I also realized that the name of my blog here has never been explained. Expect a new post in the near future with the story and a few images.